The series Domvs Adriani was captured in 2004 at Hadrian's Villa, Tivoli, Italy, a UNESCO World Heritage Site that has inspired many artists including Italian master engraver Giovanni Battista Piranesi. The complex of over 30 buildings was created as a retreat from Rome for Emperor Hadrian early in the 2nd century AD. Hadrian's Villa was the greatest Roman example of an Alexandrian garden, the recreation of a sacred landscape. It included a pool and an artificial grotto that were named Canopus and Serapeum. Canopus was an Egyptian city where a temple (Serapeum) was dedicated to the god Serapi. The architecture is Greek influenced (typical in Roman architecture of the High and Late Empire) as seen in the Corinthian columns and the copies of famous Greek statues that surround the pools. A very well traveled Emperor, Hadrian borrowed designs from the far reaches of his Empire for the complex of over 30 buildings created at Tivoli as a retreat from Rome early in the 2nd century AD. On a first tour, Hadrian traveled west to Germania, framed by the Danube and Rhine rivers, then to Britannia where he built an 80 mile wall, to Hispania and then Mauretania in Northern Africa, to the African coastal city of Cyrene, Crete, Syria, Pontus, Bithynia, Asia Minor and Thracia, Moesia, Dacia, Pannonia, Greece, Athens and Sicily. To the east, the empire extended to the Euphrates River, and Hadrian, consumed by the 'wanderlust', returned to Athens. He held a fascination for Greek philosophy and culture and as such would visit Athens at least 3 times during his reign. The city too would benefit greatly from the emperor's patronage in the form of numerous building projects and improvements. The 'Greekling' as Hadrian came to be known, also journeyed from Athens back to Asia, then to Pamphylia, Phrygia, Cilicia, Syria, Cappadocia, Pontus, Antioch and Judaea. The echoes of many different architectural orders found at Hadrian's Villa is particularly interesting. The Caryatides by the Canopus, are Roman copies of Greek statues along with the statues beside them depicting the Egyptian dwarf and fertility god, Bes. There are even Egyptian-style interpretations of Roman gods and vice versa. A Greek so called "Maritime Theatre" exhibits classical ionic style, whereas the domes of the main buildings as well as the Corinthian arches of the Canopus and Serapeum show clear Roman architecture. But interest becomes fascination at the site of the Serapeum. The Serapeum is a large nymphaeum in the form of an exedra at the south end of the Canopus (pool), which recalls the Temple of Serapis located in the city of Canopus. This temple is partly dug into the hillside. Note the rectangular pool in front of the nymphaeum. 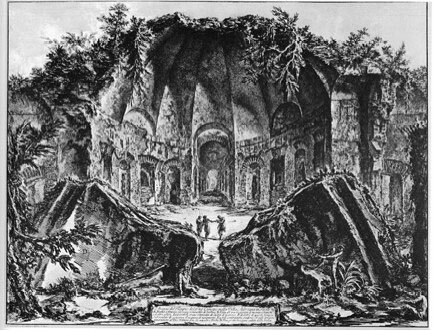 "This was a large coenatio, as the presence of a stibadion (semicircular stone bench with an elevated surface), or banquet couch indicates, that, on the basis of its orientation toward the north of the complex and the presence of gardens, pools with small waterfalls and running water obtained by means of a complex pumping system on the dome that allowed a sheet of water to fall in front of the diners, was used during the hot summer months" (Adembri 87-88). The temple built into the hillside (and partly subterranean) consists of an apse with eight niches flanking an artificial grotto. According to Henri Stierlin, "the Sanctuary of Serapis, at the farthest end of the canopus, is a place of chthonian* worship at Hadrian's Villa. A system of concentric canals and rooms that penetrate deep into the hill formed the stage for initiation ceremonies" (169). propitiatory and magical rites and generalized or euphemistic names of the deities, which are supposed to have been primarily ghosts. The Serapeum at Hadrian's Villa owes its origin to the Serapeum of Alexandria in Ptolemaic Egypt. This was a temple built by Ptolemy III (reigned 246 BC–222 BC) and dedicated to Serapis, the syncretic* Hellenistic-Egyptian god who was made the protector of Alexandria. By all accounts the Serapeum was the largest and most magnificent of all temples in the Greek quarter of Alexandria. Besides the image of the god, the temple precinct housed an offshoot collection of the great Library of Alexandria. The geographer Strabo tells that this stood in the west of the city. *Syncretism is the attempt to reconcile disparate, even opposing, beliefs and to meld practices of various schools of thought. It is especially associated with the attempt to merge and analogize several originally discrete traditions, especially in the theology and mythology of religion, and thus assert an underlying unity.